together with some friends and commentators. Have something to say? Leave your comment. Or send me an email. Occassionally, I reply. For a few months now, the file dialogs (open, save, etc) in Firefox on Linux Mint 17 KDE malfunctioned. Clicks didn’t go through and/or were interpreted as drags. I finally figured out that it was caused by the Oxygen KDE theme. 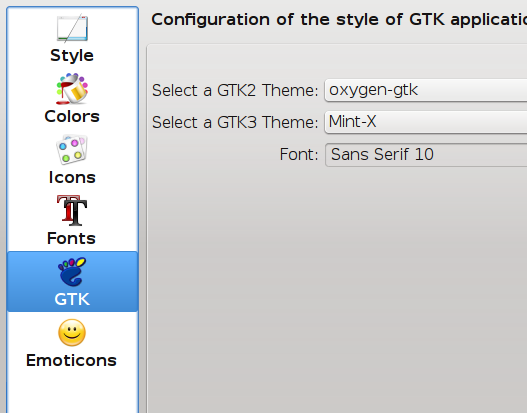 So, I installed mint-themes-gtk3 and chose Mint-X as my theme. Copyleft: These days everything you can think of is copyrighted, patented, protected or otherwise made into someone's imaginary intellectual property. I have a lot of imagination but not enough to pretend that I have some divine right to share things with you without giving you the right to share it further. That would be childish. So, everything here is licenced under a Creative Commons Attribution-Noncommercial-Share Alike license. That means that you can bloody well do anything you like with my content as long as you tell that it's from me (or the respective author). Only if you want to make money from my content do you have to ask me permission first. (As if I could be bothered to sue.) Oh, and you can't redistribute your derivate content under more restrictive terms. Share the love. Colophon: This weblog is powered by a WordPress installation running on PHP5 and MySQL, hosted by NearlyFreeSpeech.Net's outstanding FreeBSD hosting platform. The markup for this WP theme is my own and should usually validate as some sort of XHTML concoction. So should the CSS. I've actually blogged about this theme.